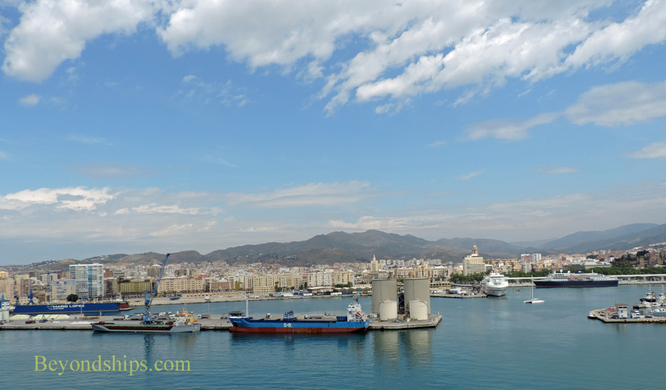 Malaga is one of Europe's oldest cities. The area around Malaga has been inhabited since pre-historic times. However, the first permanent settlement was by the Phoenicians. They were defeated by the Carthaginians who took control of the area in 206 B.C. When the Carthaginians were defeated by the Romans in the Punic Wars, Malaga came under Roman control. Vestiges of the Roman period can still be seen today including the ruins of a Roman theater in central Malaga. With the fall of the Roman Empire, control of this area passed to the Visigoths. However, in 711, Tariq ibn Ziyad led an army to victory against King Rodrigo of the Visigoths. As a result, many of the local inhabitants fled and there was an influx of Arabs and Berbers into Malaga. For the next eight centuries, Malaga would be under Islamic rule. During much of this time, the rest of Western Europe was experiencing the Dark Ages. However, for Malaga, this was a period of economic growth and prosperity. In the late 15th Century, the Christian reconquest of Spain reached the Malaga area. After several bloody battles, Malaga fell to the Catholic monarchs Ferdinand and Isabella in 1487. All but 25 Moorish families were expelled. Following the Moorish period, the city went into decline. Over time, however, the port and trade with Western Europe became increasingly important. Also, Malaga's strategic location resulted in defense spending and construction. However, the re-imposition of the feudal system and the Spanish Inquisition hindered growth during this period. Malaga suffered greatly during the Napoleonic Wars. First, its maritime trade was devastated during the period Spain was allied with France against Great Britain. Then after Napoleon occupied Spain, an active guerrilla force in the Malaga area engaged in bloody fighting with the French. Much of the city was in ruins when the French withdrew. The years following the Napoleonic Wars were marked by political instability as groups favoring a more liberal government vied with supporters of King Ferdinand VII's absolute monarchy. Malaga was considered one of the most rebellious cities in Spain. At the same time, Spain's economy was suffering as her Latin American colonies achieved independence. In the middle of the 19th Century, the situation improved. Traditional mercantile activities resumed and Malaga developed iron manufacturing. A military rebellion brought in a more liberal government. However, as that century drew to a close, the economy again declined and repressive government returned. The combination of a bad economy and authoritarian government led to political unrest. Support for socialism and anarchism grew which in turn led to the growth or reactionary groups. All of this boiled over into civil war. During the Civil War, Malaga was attacked and captured by Nationalist forces and their Italian allies. During the Francisco Franco dictatorship, which followed the Civil War, the economy of the Malaga area grew slowly. At first, it was primarily dependent on agriculture. However, as the popularity of travel grew in the second half of the 20th Century, Malaga's pleasant sunny climate began to attract tourists, particularly from the colder areas of Europe. This growth continued after Franco's death and the return of democracy to Spain.